The bewitching ability of speech and mimicry and a touch of beauty, this ash colored bird has won the hearts of many parrot lovers. Here is a method for training African Gray parrot and be the proud master of this unique bird. The only animal that possesses the power of speech other than we humans is the parrot. The mesmerizing qualities and captivating colors of this bird have aroused many animal lovers to possess them. Their peculiar qualities led them to fall victims to many hunters and traders who eventually traded these wonderful birds into the pet market for enormous prices. Parrots are born wild, but humans have conquered the ability to tame the wild for their own benefits. Parrots with their several species and colorful plumage, strong beak and broad wings, have given humans the chance to capture them. The practice of capturing these birds from the wild and taming them is prevalent for many years. Among the many parrot species, the African Gray parrot is one of the sought after birds for its high intelligence in understanding human speech and the ability to imitate different sounds. They proved to be very good companion for the great rulers and also the sailors due to their talking ability. They are temperamental and therefore require enough attention. Before bringing in this bird species, I bring some of the techniques used for training this species. 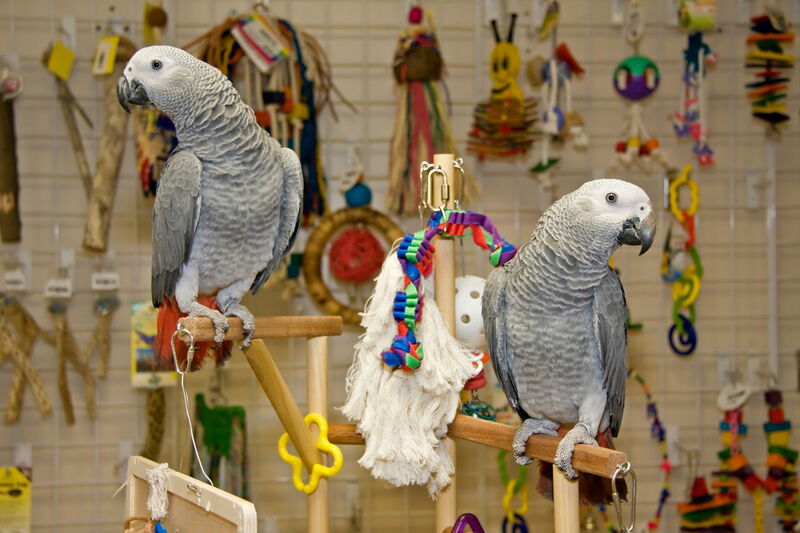 These parrots are divided into two breeds, the Congo African Gray and Timneh African Gray Parrot. They differ in color, size, features and very little in temperament. The Congo African Gray, require plenty of interaction while the Timnehs are able to adapt quickly to their surroundings and become friendly even with the strangers. Having the ability to talk and understand human language, these birds are prone to get bored if left alone. Therefore, when bringing the bird home, make sure to spend a lot of time with it and give the required attention. If the bird is deprived of attention it would probably trigger the problem of plucking feathers. Provide the birds with toys which would terminate the problem of boredom and feather plucking. Before bringing an African Gray home, install a cage or organize a place for the bird to dwell in. A proper cage can prevent the bird to take flight, as Gray Parrots are of nervous temperament leading them to abandon the new environment. These birds require attention, which play an important role in developing a strong bond. A good relationship among the owner and the bird will make training easy. They has a tendency to get attached to one member of the family, which makes it necessary to introduce it to other family members too. Spend at least an hour with the bird. It would make the bird comfortable making it easy for the African Gray to get acquainted with the family members and its environment. Skill of adapting to human language, makes this training session very crucial. Their excellence in mimicking have fooled many predators. The Gray African parrot can mimic the sounds they want and when they want. This skill acts as one of the weapons for diverting the predators attention and saving themselves from falling prey. However, the parrots do not talk until they turn a year or two old. It requires plenty of time and patience to teach them to speak. The first step towards teaching the bird is to develop a strong bond to attain certain trust of the bird. To make the bird talk, select a series of simple words that you wish to teach the bird, but keep patience as it will take its own time to analyze and register the word. Clarity in speech and a quiet environment, can help the bird learn the language faster. Hence, choose a separate and quiet room to train the bird. Keep repeating the words maintaining eye contact to assure complete attention to the pet. Praising is the best way to motivate and encourage the bird to follow the commands. Praise the bird, whenever it tries to speak or imitate sounds. Maintaining eye contact and praising the bird will increase the bond between the bird and the trainer. Once the bird learns a word, move on to the next one and follow the same procedure. As the bird's vocabulary begins to get rich, it will be easier to teach him phrases and soon you will have a talking bird in your house. Infusing certain toilet manners in Gray African is mandatory to avoid a messed up home. The bird must learn to potty in the right place, which might be in its cage or on the perch. The moment the bird settles in an unwanted place, gently pick it up and put it on the perch or in its cage where it is allowed to potty. Keep repeating it till the bird understands the wish of its master. Pick up the favorite treat of your bird as they might come handy while teaching tricks to the bird. Treating the bird after it obeys the command, encourages it to listen to the master and perform the commands well. The bird needs to get used to the touch of the master or the trainer. Therefore, it needs to accept the regular petting and handling. Offer some treats and pat it till it is comfortable and relaxed. Keep offering treats to keep the bird calm and make it stay for long hours. Continuous handling might irritate the bird resulting into bad behavior. Therefore, treat the bird as long as it behaves well. Step-up: After getting used to handling, move on to teach the Step-up trick. Step-up is a way to teach the bird to settle on your hand or the perch. To begin with it, open the cage and place your hand in the front and keep repeating the command "Step-up" till the bird makes an attempt to step-up. Remember to praise for its efforts. Continue to repeat the command till the bird masters the skill of step-up on the hand or the perch. Wave: Another simple trick to teach the bird is to wave. Slightly, tickle the bird's feet with the finger or a blunt object and the moment when it lifts its foot, give theWave command. Gradually the bird will learn the command and begin to obey it. Always say words or treat the bird when it listens to the commands. Turn Around: This is among the simple tricks. In order to train the parrot for this trick, keep plenty of its favorite treats. Before starting, take up some warming up session for African Gray. Ask the bird to step up a few times and give it time to settle on its perch. After it has obeyed all your demands, hold its treat in front of its face maintaining a certain distance. As the bird charges to grab the treat move it to its back and watch the bird automatically turn towards its reward. Some Gray Parrots might just turn their heads while some may completely turn their body. As the parrot performs the action, give theTurn Around command and soon the bird will understand the demand of its master. It makes a great companion for the humans because of its peculiar skills. Combination of beauty and brains, this bird can very well adapt to the human ways of communication. Unfortunately, due to lack of attention and care the bird faces the problems of feather plucking, screaming and biting. Among these problems feather plucking is a grave issue. It has many causes such as poor diet, abuse, neglect, boredom and medical problem. These severe problems are avoidable by showing more love and tenderness towards this feathered creature. So, train your parrot and enjoy lifetime companionship of this unique bird.